Democrats fare even worse in off-years. In the last two midterm elections, Republicans were more than 20 percent likelier to vote than Democrats. Young people and people of color — both stalwart constituencies of the Democratic Party when they show up at the ballot box — tend to be the worst offenders when it comes to not voting. The forces behind the “Blue Wave” are looking to change that, fueled by a historically unpopular president and a moment of intense cultural reckoning. Michael McDonald, a professor of political science at the University of Florida, said in an interview with The New York Times that early voting surges signalled record high voter turnout going into the midterms. Or, more precisely, a voter turnout rate that no one alive has experienced. In 2018, more contested races are driving participation up, aided by coordinated efforts to channel dissent into voter turnout. Conservatives malign the Democratic fervor as “mob-like,” but a century ago the long line at the ballot box was the result of the actual mob. 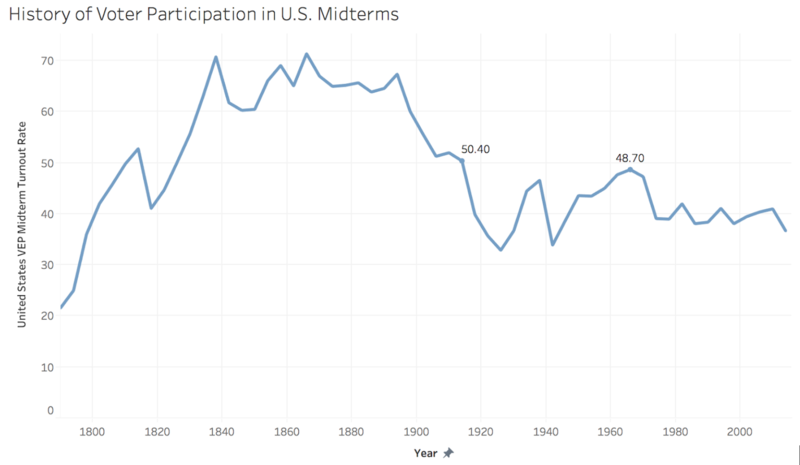 In the late 1800s, voter participation in the midterms regularly exceeded 65 percent. Political machines got people a little overzealous about voting, sometimes impossibly so. Election fraud inflated voter participation to suspect levels — in New York’s 1844 elections, 135 percent of eligible voters cast ballots. According to Atlas Obscura, political parties used strategies “more often associated with pirates and human-trafficking gangs.” Tammany Hall, one of the era’s most notorious gangs, bought votes and upped its ballot count through intimidation and creative rule breaking. The machine employed tactics that included casting votes in the name of fictitious individuals and a practice known as “cooping,” in which politically engaged thugs would kidnap voters, ply them with alcohol and force them to vote repeatedly, clad in various disguises to throw any suspicious pollsters off the scent. A 19th century election was a downright rowdy affair, a far cry from the borderline dreary procedure of modern voting, where voters wait demurely in dusty high school gymnasiums or local church halls to mark off their preferences on official ballots. Drinking, yelling and all-out brawls were the rule, not the exception. In the 19th century, children, youths, and adults ‘mingled freely together’ at rowdy campaign rallies, lured by the holy trinity of booze, barbecue, and bonfire. Older citizens introduced young people to politics, helping to drive voter turnouts to their highest levels in U.S. history. ‘It’s the “big fellow,”’ observed the Republicans canvassing in pool halls and saloons in the 1880s, who does the best job getting ‘the “little fellow”’ into politics. The last time more than half of the population voted in midterms was in 1914. Voter participation began to taper off with the introduction of Progressive Era reforms like the implementation of the secret ballot in the 1890s, which weakened the political parties and constrained their mobilization strategies. Gangs like Tammany Hall could no longer rely on coercive tactics to force votes along party lines. There wasn’t much point in forcing people to show up if you couldn’t guarantee they’d actually back your candidate. These reforms also froze out the youth vote. Shifts in cultural thinking and Progressive Era child labor laws ended up doing more than blocking kids from working dangerous factory jobs — they isolated young people from traditional avenues of political engagement. In 1909, activist Jane Addams opined that democracy “no longer stirs the blood of the American youth,” as “never before have the pleasures of the young and mature become so definitely separated.” Youth political involvement relied in large part on regular exposure to partisan elders, and without that, enthusiasm — and participation — waned. Voter turnout wouldn’t reach comparable levels for another 50 years. When voter turnout hit a high water mark in 1914 and 1966, two different progressive crusades with two markedly different effects on voter participation were at play, both marked by intense cultural turmoil and structural changes to American democracy. In the early 1900s, reformers rooted out corruption and diminished political involvement in the process. Half a century later, the Civil Rights movement tackled segregation and discrimination, opening up the polls to people of color and stoking their passions to get them there. Over the course of the 20th century, distaste for the status quo stifled voter participation, then fueled it. The activists of the 1950s and 1960s put their bodies and their lives on the line, enduring brutal attacks at the hands of law enforcement officers and white vigilante groups, most notably during a 54 mile march from Selma to Montgomery, Alabama. In the wake of the incident, and the outrage it engendered, President Lyndon B. Johnson called for comprehensive voting rights legislation. A landmark achievement, the Voting Rights Act of 1965 outlawed underhanded tactics like literacy tests, which ensured African Americans suffered systematic disenfranchisement across the South. After its passage, African American political involvement flourished. By the end of the year, 250,000 new black voters were registered. On a single day in Selma, Alabama, 381 African Americans registered to vote — more than had registered to vote in the entirety of Dallas County in the previous 65 years. Incumbent political machines — from 19th century mobs to modern Republican-held state legislatures — assert power by alternately inflating voter participation and purging it, whichever trend benefits their coalition. Historically, the progressive reactions to these machines have ultimately upended these status quos with a mix of structural reforms and galvanizing voters. In line with previous peaks in voter turnout, this year’s midterms seem set to benefit from a reaction to a long-term erosion in the structure of our democracy and from the attendant fervor these changes have aroused in voters. Young people may well be the face of this insurgence. A biannual report from Harvard University’s Institute of Politics indicated that “young Americans are significantly more likely to vote in the upcoming midterm elections compared to 2010 and 2014,” with 40 percent of 18 to 29-year-olds saying they will “definitely vote” in November. IOP’s director of polling, John Della Volpe told the The Atlantic that if slightly more than one in five people ages 18 to 29 head to the polls, it would be a record turnout for young voters. According to the Pew Research Center, voters are “more enthusiastic about voting than in any midterm election” in more than two decades. Turnout in early voting has already spiked across the political spectrum, driven by the divisions stoked by a distinctly controversial president. At the same time, recent structural changes to the American voting process have been aimed at suppressing voter participation. Whether these changes succeed in intimidating the historically disenfranchised and chronically discontent or work instead to invigorate them could determine the balance of power in the U.S. for years to come.